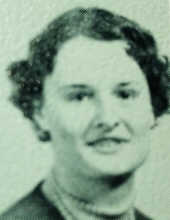 Elizabeth McCuen (nee Casper) of Knox was born to Eternal Life Thursday, March 21, 2019 at the age of 80. Loving wife of 52 years to Robert McCuen of Knox. Proud mother of Robert (Tricia) McCuen, Jr. of Franklin, Wisconsin and Diana (nee McCuen) Hutchinson of Knox. Cherished grandmother to Diana’s girls: Alyssa (Lyssa Pooh), Kalista (little sweetheart), Savannah (little Elizabeth), Cierra (Cierra Belle) and Robert’s children: Merissa, Andrew, Morgan, and Terrah. Great-grandmother to Zoey. Elizabeth was surrounded with love, family and friends in fellowship while passing. She was a long term resident at Golden Living in Knox, Indiana and will be missed by many. To send flowers or a remembrance gift to the family of Elizabeth McCuen, please visit our Tribute Store. "Email Address" would like to share the life celebration of Elizabeth McCuen. Click on the "link" to go to share a favorite memory or leave a condolence message for the family.